Are you ready for a Giant Deal ? JUST IMAGINE THE TRICKS THAT YOU CAN DO WITH THESE CARDS! PRINTED ON NON-WARPING MULTI-LAYER LINEN CARD STOCK AND DIE CUT TO ENSURE UNIFORMITY. NO FURTHER DECKS WILL EVER BE MADE. THE MOST UNIQUE DECK IN THE WORLD. The cards were created from photographic stencils and the court cards are done in three bright colors. The back design shows the famous Hades Four Roads to Magic logo (an optical illusion reproduced here). The cards come boxed in a handsome case especially made for them. 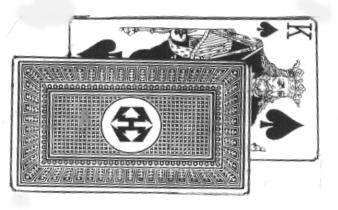 Can be seen clearly from any stage and may be used in many tricks like Three Card Trick Using Four Cards, Pick-it-Out, Cards Up the Sleeve and many more. A Truly Giant Pack of Cards. Made from special multi-layed stock to prevent the cards from warping. Don't miss this opportunity to buy a monumental memory-maker. Only a few sets are still available, THERE WILL BE NO MORE! Don't pass this up. It would cost you thousands of dollars to get a pack of these cards made now. Only $200.00 U.S. plus postage for the complete deck.